Jeffrey Fails, 30, of Lima, will stand trial Jan. 22 on charges of kidnapping, extortion and robbery after waiving his right to a speedy trial on Tuesday. 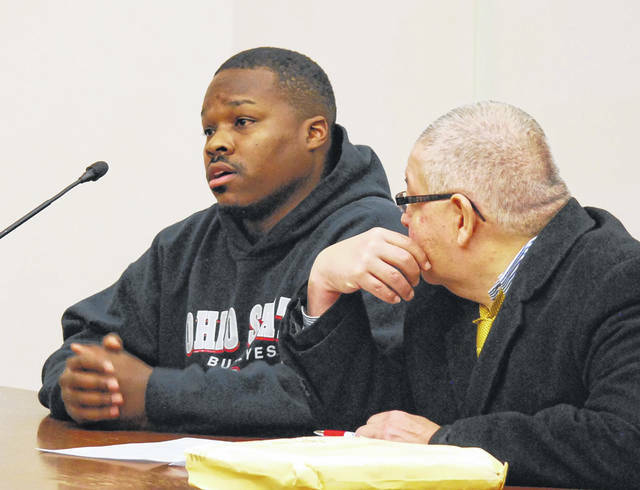 LIMA — A Lima man charged with kidnapping, extortion and robbery on Tuesday waived his right to a speedy trial while maintaining his innocence. Jeffrey Fails Jr., 30, appeared briefly in Allen County Common Pleas Court Tuesday and agreed to forfeit his constitutionally-guaranteed right to a speedy trial. A previously scheduled date of Dec. 17 for a jury trial was pushed back until Jan. 22, but Fails stressed to the court that he wished to proceed to trial as quickly as possible. Judge Jeffery Reed said Fails’ attorney, Joe Benavidez, had indicated that additional time was needed to prepare for trial, following a motion to suppress some evidence in the case and the recent polygraph test to which Fails consented. Fails reluctantly agreed to the additional time. Fails and Justin Meeks, 30, were indicted in March on identical charges after allegedly assaulting a student at the University of Northwestern Ohio and then driving him to an ATM machine, where they demanded he “drain his account” and turn the money over to his assailants. The kidnapping charges are first-degree felonies, while the robbery charges are second-degree felonies. Extortion is a third-degree felony. https://www.limaohio.com/wp-content/uploads/sites/54/2018/11/web1_Jeffrey-Fails-..-time-waiver.jpgJeffrey Fails, 30, of Lima, will stand trial Jan. 22 on charges of kidnapping, extortion and robbery after waiving his right to a speedy trial on Tuesday.